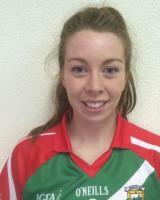 County: Mayo County Grade: Senior Name: Sarah Tierney Club: Hollymount Position: Defender Occupation: Trainee Accountant Toughest opponent: Geraldine McLoughlin When did you start playing Ladies Gaelic: 9 years of age High point of your career to date: Winning the All-Ireland with UL in my final year of college. Biggest Disappointment: Losing out to Kerry last year in the All-Ireland quarter final. Favourite Player: Female: Fiona McHale	Male: Jack McCaffery Nickname: To inappropriate to reveal. Favourite Ground: Limerick Gaelic Grounds. Favourite Ladies Gaelic Football Skill: Block. Ladies Gaelic Football Achievements: National League Div 2 Title. 1 Club Intermediate County Championship 2012. Intermediate North American Title with Aisling Gaels, Chicago 2011. Captained Mount St Michael Secondary School to All Ireland PPS Senior B Schools Title 2010. Connacht PPS player of the year 2010. Captained UL to Oâ€™Connor Cup Title in 2014 & Jim Kennedy Cup Title 2014. College Interprovincial team 2014 & 2015. HEC All Star recipient 2013 & 2014. Influences on your career: My brother Mark and looking up to the Mayo Ladies teams that won All Irelands when I was younger.